Palestinian Authority President Mahmoud Abbas's ruling Fatah faction is angry. It seems a Jewish Israeli businessman has just built a shopping mall in east Jerusalem and most of its workers and customers are Arabs. Where in the world would any leader condemn a project that provides jobs to hundreds of his or her people? Where in the world would any leader call on his or her people to boycott a shopping mall or a supermarket that offers competitive prices for clothes and food? Where in the world would a leader describe the opening of a commercial project that benefits his or her people as a catastrophe ("nakba")? Rami Levy, a businessman and owner of the third-largest Israeli supermarket chain, invested more than $50 million in the construction of a mall in the Atarot Industrial Park northeast of Jerusalem. Despite the boycott calls, some Palestinians have rented stores in the mall, which is being described as a model for coexistence between Arabs and Jews. The new mall also has a large supermarket belonging to Levy's supermarket chain. Levy's supermarkets in Jerusalem and the West Bank are popular among Palestinian shoppers. They say the prices there are lower than those in Arab-owned businesses. That is most likely why hundreds of Palestinians converged on the newly opened supermarket in the mall when it officially opened on January 8. 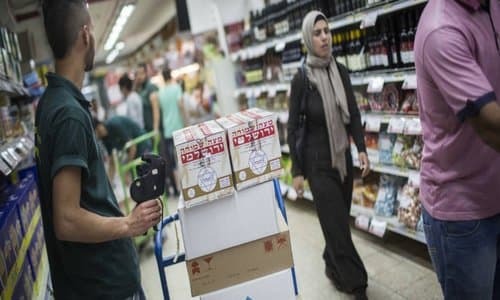 Israeli supermarkets hire hundreds of Palestinians from the West Bank, as well as Arab residents of Jerusalem, who work together with Jewish colleagues. According to Levy, half of his 4,000 employees are Palestinians and Israeli Arabs. "I began employing Palestinian and Israeli Arab workers at the first Rami Levy location, a stall in Jerusalem's Mahane Yehuda market that opened in 1976. Arabs were among my first employees," he said. "Those employees continue to work for Rami Levy Hashikma -- our supermarket outlets -- and many have seen their careers flourish with the company. The first employee I hired 35 years ago was a man named Ibrahim, an Arab from east Jerusalem who has remained at Rami Levy and currently works as our director of logistics. Other Arab Israeli and Palestinian employees who have since joined the Rami Levy team have also been promoted to upper management positions. Rami Levy does not discriminate on the basis of ethnicity, gender, or religion when hiring and promoting employees. All employees, Palestinians and Israelis, are treated equally and receive equal benefits. Salaries are based solely on one's position and performance. My goal for all Rami Levy employees is to have the same opportunity to succeed. This goal that can only be realized if the principle of equality is implemented in all aspects of the company." For Abbas's Fatah officials, however, the image of Palestinians and Jews working in harmony is loathsome. They do not like the idea that Palestinian workers are being paid good salaries and are being treated by their employer with respect. They also do not like seeing Palestinian shoppers queuing to buy food and goods that are being offered to them in better quality and cheaper prices. The Fatah officials would rather see their people unemployed or pay higher prices in the Palestinian market than give their business to a Jewish-owned shopping center. Instead of welcoming the inauguration of the shopping mall for providing job opportunities to dozens of Palestinians and lower prices, the Fatah officials are taking about an Israeli plan to "undermine" the Palestinian economy. "This was a sad day for Jerusalem," said veteran Fatah official Hatem Abdel Qader Eid in reference to the opening of the new mall. "This project aims at undermining the Arab commerce in Jerusalem and making it subordinate to the Israeli economy." The hundreds of Palestinians who flooded the new mall on its first day, however, seem to disagree with the grim picture painted by Abdel Qader Eid. The large turnout is, of course, good news: it shows that Palestinians are like any customers around the world who prefer better products at lower cost. For them, this was not a "sad day," as the Fatah official said, but an exciting one. Finally, a mall has come near their home, offering them a wide range of products at economical rates. Nonetheless, Abdel Qader Eid got one thing right: his lament concerning the absence of Palestinian investors and capital. "Palestinian capitalists are cowards," he said. Palestinian investors, Eid added, could have prevented Rami Levy from building his new mall had they invested in the construction of a Palestinian shopping mall. "It's true that there are wealthy Palestinian businessmen. But while they are rich with money, they are poor in their will and education." Sadly, the Fatah official is saying that Palestinian businessmen have no faith in their people and would rather invest their money elsewhere. Another senior Fatah official, Osama Qawassmeh, took the incitement a step further. He warned that any Palestinian who shops at the new mall or rents space there will be accused of "betraying the homeland." He went on to peddle the old Palestinian lie that purchasing Israeli products is an act of "supports for settlements and the Israeli army." Fatah's incitement against the new mall did not fall on deaf ears. On the day the mall was inaugurated, Palestinians threw a number of firebombs at the compound, forcing (Palestinian) shoppers to flee for their lives. Fortunately, no one was hurt and there was no damage to the stores or vehicles in the parking lot. The campaign of incitement against Levy's shopping mall began several months ago, as it was being built, and has continued until today. Now that the campaign has failed to prevent the opening of the mall, Fatah and its followers have turned to outright threats and violence. The threats are being directed toward Palestinian shoppers and Palestinian merchants who rented space in the new mall. The thugs who attacked the mall with firebombs could have injured or killed Palestinians. The thugs, who are believed to be affiliated with Fatah, would rather see their people dead than having fun or buying attractively-priced products at an Israeli mall. By spearheading this campaign of incitement and intimidation, Abbas's Fatah is again showing its true colors. How is it possible to imagine that Abbas or any of his Fatah lieutenants would ever make peace with Israel when they cannot even tolerate the idea of Palestinians and Jews working together for a simple common good? If a Palestinian who buys Israeli milk is a traitor in the eyes of Fatah, it is not difficult to imagine the fate of any Palestinian who would dare to discuss compromise with Israel. If he is lucky, he will have a close encounter with a firebomb. If he is not lucky, he will be hanged in a public square. How is that for Palestinian readiness to engage in a peace process with Israel?